1. Prepare chicken the night before by cooking the breasts whole and then refrigerating them. When you are ready to make the salad, that’s when you can shred and/or dice the chicken. I included pieces both diced and shredded for different textures. 2. After you have finished the chicken add that to a large bowl. 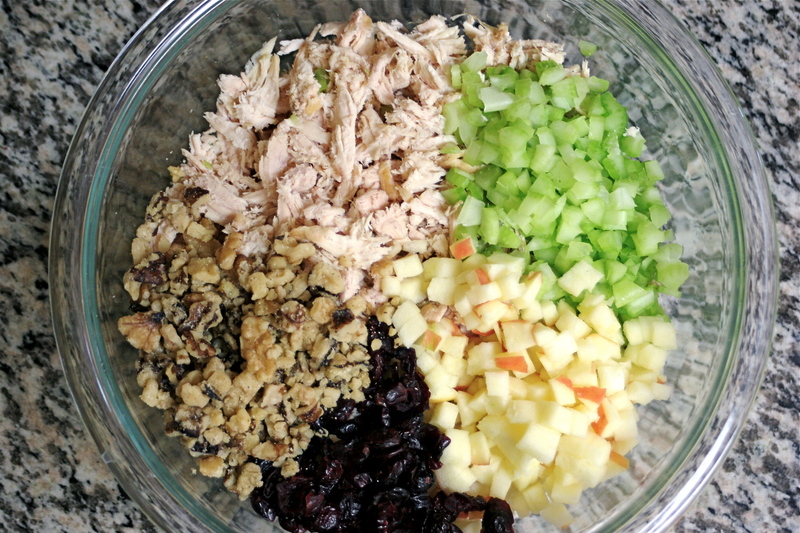 Chop your walnuts, celery, and apples and add those to the bowl. Add the craisins as well. You can chop those if you would like, but you don’t have to. 3. In a smaller bowl, make your dressing. Start with the mayo and then add the lemon juice, salt, and pepper. Continue to add the ingredients until you get a taste that you like. Mix the dressing into the bowl and make sure each bit of food is covered. 4. Serve over a bed of lettuce or on a sandwich. Goes great on buttermilk toast! I love eating chicken salad sandwich with field greens and a light dressing, but this time, I chose to toast some buttermilk bread and ate it on that with a few pieces of lettuce. The butter from the bread makes the chicken taste amazing. And who doesn’t love carbs? Love, like a chicken salad or restaurant hash, must be taken with blind faith or it loses its flavor.